With the Florida Gators just days away from their fifth game of the season under head coach Will Muschamp on Saturday at 8:00 p.m. against the Alabama Crimson Tide, he spoke during the Southeastern Conference coaches teleconference to provide some insight about where his team is at going into into week five action. For Muschamp, being effective in running the ball and stopping the run are characteristics that he wants to help define the Gators. In addition to that, he believes those abilities will result in Florida being successful for the long haul. “I have not and I don’t know that I’ve seen one,” Muschamp said when asked if he’s seen a winning team operate without a solid running game. “Running the football is number one to me, it creates toughness on your football team. You’re going to come to times in your schedule – whether it’s in the red zone or to end the game – it’s just a matter of toughness to me. Stopping the run and playing the run. I always wanted, when I got a head coaching opportunity, to be balanced in what you do. Even though running backs senior Jeff Demps and redshirt senior Chris Rainey are a pair of undersized (for their position) speedsters, Muschamp said the Gators have concentrated on using them inside as well as outside the tackles. [EXPAND Click to expand and read the remainder of this post. ]Since he took the helm at Florida, Muschamp has preached “taking care of the state of Florida” when it comes to recruiting, ensuring that the Gators get the best players in-state before targeting players nationally. 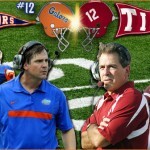 He said that will not change with another team and a large recruiting base being added to the Southeastern Conference. He also noted that, just because Texas A&M has joined the SEC does not mean Texas high school football players will suddenly have more of a reason to leave the state. » Muschamp reiterated in his opening statement that the entire team is healthy except for redshirt junior cornerback Jeremy Brown, who will neither dress nor play on Saturday. » Muschamp on Alabama RB Trent Richardson: “He’s an outstanding player and has got a low center of gravity, great balance, great vision. He’s a one-cut guy. When he sees the hole and gets it going north and south, he gets the ball downhill. You hardly do not see any negative run plays with him. He’s always moving the chains in a positive direction for their team. You got to gang tackle this guy. You’re not going to get him down single-handedly a lot of the time. We need to do a good job with eyes on the ball and leveraging the football the right well and tackle well and wrap and get him down which, at times in the secondary, we’ve been very average. That is the SWAMP,there is not a Bigger,Badder Beast than A GATOR.SHOCK THE FOOTBALL WORLD!!!!!!!!!!! This is the week that we either step it up and prove we can once again run with the big dogs, or keep building for next year. This will be a good week…Gators 31 Bama 17…Shock the World is right!